McKelvey, Michael G. Moses, David and the High Kingship of Yahweh: A Canonical Study of Book IV of the Psalter. Piscataway, NJ: Gorgias, 2014, pp. 358, $50, paperback. Michael G. McKelvey is an assistant professor of Old Testament at the Reformed Theological Seminary (RTS) in Jackson, Mississippi. He received his M.Div from RTS (2005) while receiving his Ph.D from the University of Aberdeen in Scotland (2008). McKelvey is also an ordained Presbyterian minister and has served as a pastor for numerous years in various locations. As such, almost all of McKelvey’s publications are written in a style that bridges the academic with the ecclesiastical [see, for example, “Ecclesiastes” in A Biblical-Theological Introduction to the Old Testament: The Gospel Promised (2016) and “The Table of the Showbread” in Table Talk (2017)]. 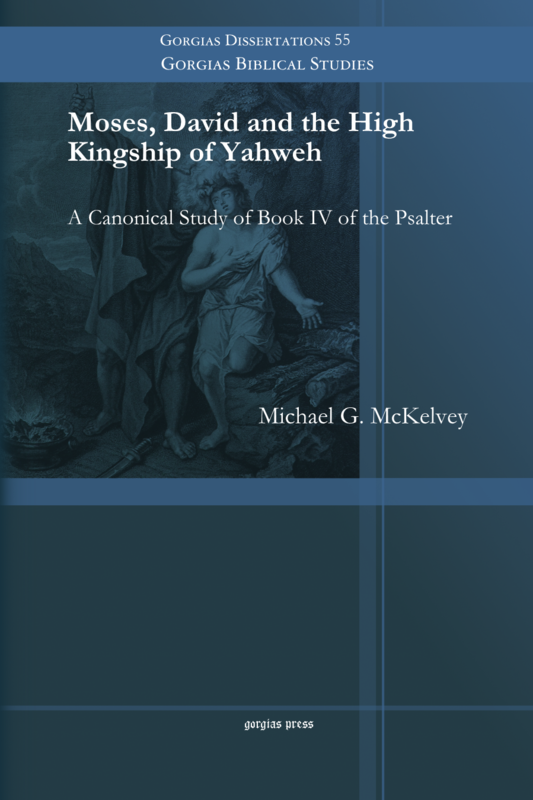 Moses, David, and the High Kingship of Yahweh is the publication of McKelvey’s doctoral dissertation. Within this work, McKelvey seeks to evaluate the nature of three literary figures—Moses, David, and King Yahweh—within the context of Book IV of the Psalter (Pss 90–106). This analysis follows a canonical approach to reading the Psalter. In McKelvey’s utilization of this approach, he has been primarily influenced by the work of Gerald Wilson (The Editing of the Hebrew Psalter, 1985). In agreement with Wilson, McKelvey argues that there is an “apparent narrative” within the Psalter that displays a poetic reflection upon the Davidic monarchy within Books I-III (Pss 2–89; pp. 12-14). The goal of this narrative climaxes in Psalm 89. As McKelvey states, “Books I-III of the Psalter have apparently been thematically grouped around the Davidic covenant and its apparent failure, a theme which undoubtedly occupies a major part of Psalm 89. The fall of the kingship is ultimately seen in the exile of God’s people, and as a post-exilic psalm, Psalm 89 displays the woes of Israel and its confusion over exile” (p. 38). Thus, McKelvey also agrees with Wilson that Books IV-V (Pss 90–105) “being post-exilic/post-monarchic compilations, seem to respond to what has gone before, especially Book III and Psalm 89” (pp. 15-16). Even so, McKelvey disagrees with Wilson over the role of the Davidic covenant and monarchy within Book IV. While Wilson argues that the “Davidic kingship is no longer curial in Psalms 90–106,” McKelvey, in agreement with David M. Howard (The Structure of Psalms 93–100, 1997), argues that “the occurrence of Davidic superscriptions, royal psalms and Royal/Zion theology in Books IV-V imply that [the] Davidic kingship still factors into the overall perspective of the Psalter” (pp. 15; 309-11). In second to Wilson, McKelvey’s methodology is also influenced by the work of Jamie A. Grant (The King as Exemplar, 2004), who is the author of the book’s forward (pp. xv-xvi). Grant notes that most evaluations of the Psalter’s structure tend to focus on concatenation or the conjunctive features that link the individual Psalms together. In addition to concatenation, Grant contends that the Psalter also contains disjunctive features that help to separate the smaller sub-groups found within the Psalter. While Grant only applies such an analysis to Psalms 1–2, McKelvey expands upon Grant’s work by applying this method to the entirety of Book IV (pp. 253-77). The chosen arrangement of McKelvey’s chapters seems for the sake of responding, both positively and negatively, to the works of Wilson and Grant. After explaining his methodology in chapter 1, chapters 2 through 5 provide the reader with an exegetical analysis of every Psalm within Book IV. Four main elements are found within this exegetical analysis (pp. 17-18). First, each Psalm is translated. Second, the individual themes and theology of each Psalm are discussed in light of how the Psalm relates to God (theocentric themes) and man (anthropocentric themes). Third, other important elements found within each Psalm are discussed focusing on the figures of McKelvey’s emphasis—Moses, David, and King Yahweh. Fourth, the canonical relationships between each Psalm and its surrounding context are demonstrated by means of intertextual links and thematic connections. Chapter 6, then, seeks to synthesis chapters 2-5 while also defending McKelvey’s argument that Book IV consist of a four-fold structural division of sub-groups: 90–92, 93–100, 101–104 and 105–106. This chapter is also the place were McKelvey applies Grant’s conjunctive and disjunctive methodology to Book IV. Lastly, chapter 7, another synthesis of chapters 2-5, seeks to explain how the literary figures of Moses, David, and King Yahweh function within Book IV and “what they say to Israel’s post-exilic audience” (p. 282). McKelvey then concludes the work with affirming the basic arguments of both Wilson and Grant; McKelvey supports Wilson in stating that Book IV is the “editorial heart of the Psalter” (p. 326) and concludes similarly to Grant that “the messianic theme of Psalms 90–106 is of great significance in light of the New Testament” (p. 327). Overall, the book offers two main positive features. First, the work is a well-written consolidation of all relevant research on Book IV of the Psalter. As such, the work is very extensive and provides anyone interested in studying the canonical nature of Book IV with one resource from which to begin. Second, the work contains both heavily academic topics (pp. 69-72) as well as devotional insights into the editorial design of the Psalter (p. 97). Thus, while much of the contents of the work might be too scholastic for the average Bible reader, many of McKelvey’s theological insights would be very beneficial for preaching and teaching through Book IV. Despite these benefits, the book has a few shortcomings. In order for McKelvey to divide Book IV into a fourfold structure, he must rely heavily on the editorial placement of each superscription or lack thereof. McKelvey notes that there is an uneven distribution of superscriptions within Book IV and concludes that this sort of distribution is a sign of editorial design. For example, McKelvey argues that Psalms 90–92 are a sub-group because “the employment of psalm titles [superscriptions] in Book IV separates Psalms 90–92 from their untitled neighbors” (p. 260). McKelvey cites Grant in support of viewing the superscriptions as an intentionally disjunctive feature within of the Psalter (p. 259). While this may be true and had been argued for in the work of M. D. Goulder (see, for example, The Psalms of the Sons of Korah, 1982), McKelvey does not argue for the importance of viewing the superscriptions as an interpretive part of the Psalms redactional history. Instead, this is simply assumed throughout the work. Also, McKelvey disagrees with Wilson’s argument for viewing Book IV as framed by an “overlap/interlocking” editorial technique because McKelvey views the technique to be “quite complicated for the pre-critical period of editors of the Psalter” (p. 275). While McKelvey is correct in affirming that Wilson’s approach neglects to analyze the disjunctive features of Book IV, numerous works have been written on the complicated process behind the formation of the Old Testament texts, which would confirm Wilson’s proposed editorial technique as a historical possibility (see, for example, Karel van der Toorn, Scribal Culture and the Making of the Hebrew Bible, 2009 and David M. Carr, The Formation of the Hebrew Bible: A New Reconstruction, 2011). While these points of contention are somewhat significant, they do not negate the work’s overall contribution to reading the Psalter canonically. In all, McKelvey’s work is highly recommended.